Ibrahim Liman, the head of a local anti-jihadist militia force, confirmed the details of the attack. 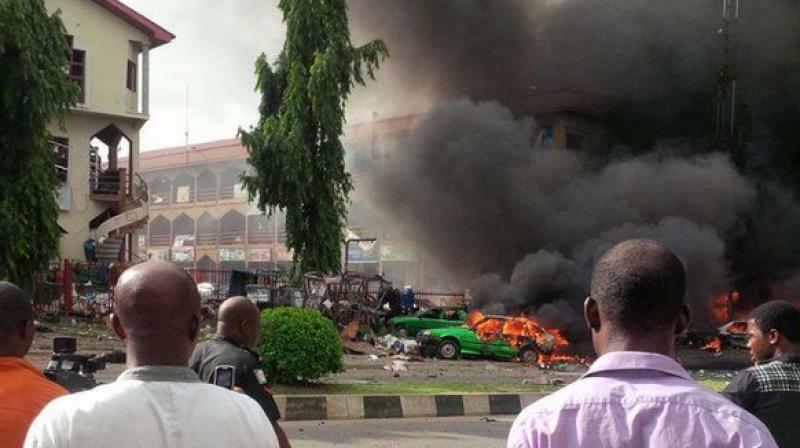 Kano (Nigeria): Three women suicide bombers blew themselves up at the entrance to a camp for displaced people in northeast Nigeria on Tuesday, killing 28 people and wounding 82, local sources said. The attack -- the latest in a string of assaults in the troubled region -- took place in the town of Mandarari, 25 kilometres (15 miles) from Maiduguri, the capital of Borno state, said Baba Kura, a member of a vigilante force set up to fight jihadists. "Three female bombers triggered their explosive outside of the IDP (internally displaced persons) camp... killing 28 people and wounding 82 others," Kura said. The first assailant blew herself up, triggering panic, Kura said. "People were trying to close their shops when two other female bombers triggered their explosives, causing most of the casualties," he said. Ibrahim Liman, the head of a local anti-jihadist militia force, confirmed the details of the attack, and said that more than 80 injured had been taken to Maiduguri hospital. A source at the hospital said a "huge number" of patients had arrived. Northeast Nigeria is a hotbed of activity by the Boko Haram jihadist group, involving shootings, bombings and kidnappings. It launched an insurgency in 2009 that has killed about 20,000 people and displaced around 2.6 million others, creating one of the world's biggest humanitarian crises. Nearly two million are suffering from acute malnutrition, according to UN figures. After being elected to power in 2015, Nigerian President Muhammadu Buhari made tackling the insurgency a priority, winning back swathes of territory and declaring that Boko Haram is "technically defeated". But this year has seen a surge in attacks, including an audacious assault on an oil exploration team that killed 69 people in Borno in July, raising fears that Boko Haram is regaining strength. That attack prompted Vice President Yemi Osinbajo -- standing in for President Muhammadu Buhari who is on indefinite sick leave -- to tell the millitary to step up its response. Osinbajo issued "fresh directives... to immediately scale-up their efforts and activities in Borno state... to maintain a strong, effective control of the situation", his spokesman Laolu Akandehe said. In August, however, 72 people have been killed in northeastern Nigeria, including 31 fishermen on islands in Lake Chad, according to an unofficial toll compiled from news reports.